Prior to the current war, approximately seventy-four percent of the Syrian population was Sunni Muslim while thirteen percent were members of other Muslim groups, including Alawites, Ismailis, and Shi’a Islam, and Shi’as. Members of the Druze sect accounted for approximately three percent of the population. And the ten percent of the country belonged to various Christian groups, including Greek Orthodox, Syriac Orthodox, Maronite, Syrian Catholic, Roman Catholic and Greek Catholic. These religious communities enjoyed a “modicum of freedom of religion” under Assad’s authoritarian regime, tempered by government control of the selection of Sunni Muslim imams, occasional minor tensions between religious groups, and other restrictions. As early as February 2012, whatever religious freedom existed in Syria had vanished. Christian families expressed their fear of being trapped and targeted during the civil war. Their fears have been confirmed. In early September 2013, Christians were forced to flee the ancient Christian town of Maaloula after extremist Islamists led an incursion into the town. Maaloula is home to two of the oldest surviving monasteries in Syria and is now nearly empty of inhabitants. Due to the heavy shelling, one of the monastery was bombed, and more than thirty Christians went missing and six were killed. On September 21, rebels brutally beat a 26-year-old Assyrian Christian to death after they learned he was a Christian. On September 26, 36 ulemas of Douma, a large suburb of Damascus, issued a fatwa justifying the confiscation of Christian homes and property to purchase weapons, to help orphans and the poor, and to provide for the families of martyrs. In October, Islamist militias began raiding Sednaya, another Christian village north of Damscus, killing and wounding some of the Christians who lived there. These attacks are part of a pattern that some Syrian Christians believe is an attempt to eradicate them from the country. As Nina Shea, a human rights activist and former commissioner on the United States Commission on International Religious Freedom, has explained that rebel groups have also targeted Christian leaders. 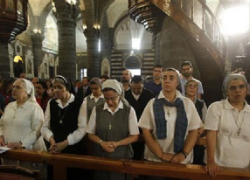 In June a Catholic Syrian priest was murdered, allegedly by beheading. Priests and clergyman from various backgrounds were abducted, kidnapped, and killed during the summer. In this context, it is naïve to think that the end of persecution will follow the end of the civil war. The Christian population in Iraq has plummeted by fifty percent since 2003 due to religiously motivated acts of violence and intimidation. In Egypt, the fall of Mubarak has led to a rise in attacks on Coptic Christians and their places of worship. In fact, throughout the Middle East, sectarian bombings, murders, kidnappings, and threats have caused an exodus of Christians from the faith’s birthplace. These precedents are ominous for Syrian Christians. The Apostle Paul visited the thriving church in Damascus in the first century, but if the suffering of Christians in Syria continues to be ignored, this millennia-old population, including some who even speak Aramaic, the language of Jesus, could become extinct. It is time for this possibility to rank equally with the other human rights violations in Syria. Bryan Neihart is a third year law student at the University of Denver Sturm College of Law, a master’s candidate at the Korbel School of International Studies, and the Survey Editor of the Denver Journal of International Law and Policy.